Regas is an all-star letterpress design studio, located on the sunny second floor of a small Greek Orthodox church in the heart of Manhattan. 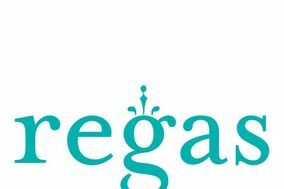 As a brand, Regas embraces tradition while constantly seeking new inspiration. We look to bring innovation and a thoughtful design philosophy to all that we do  so painting, sketching, paperback novels, studio field trips, and daily belly laughs in our space help us to keep the creative process light and the designs fresh. Our studio team works seamlessly together to provide you with the best possible service. And when partnering with Regas, you can expect gracious guidance, commitment, and - most importantly - quality paper that you love.